Good morning (well, it's morning here in New Zealand anyway...). edit: seeing as there's so many art pieces going up, I changed the name of the thread. Obviously I have a limited knowledge of the Death Company (or really, Blood Angels)...but perhaps the build could be the pre-deployment version? That is, so far as I know he wasn't *always* a chaplain, and instead was just another cursed recruit remanded to the Death Company for service. 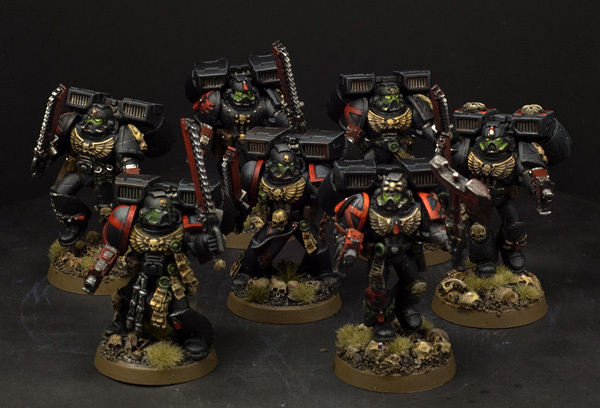 Depending on how you feel about battle-damage and the like, you could make it more of a semi-ornate assault marine suit with heavy close-quarters damage showing Lemartes at the moment of his (expected) execution, before his actual ascension as Chaplain & Commander of the Death Company? PRIMARCH PROGENITOR! TO YOUR GLORY, AND TO HIS ON TERRA! I've already got a very good idea of what I'm going to do for my build. I had a (sort of) back story, but I really need to flesh it out a bit. It basically went along the lines of him being an awesome strategist and warrior, he rose through the ranks of the Blood Angels to eventually become Captain of one of the Battle Companies. He was a veteran of many conflicts, and a prime candidate for the Sanguinary Guard. Just an all round badass who was destined for greatness. Until the Black Rage consumed him. Since then, he has fought countless battles as Lemartes' 2IC, at the head of all Death Company assaults. I took elements of Tycho and Lemartes for him. His armour is going to be quite ornate, almost artificer-like. Lots of gold details. But he needs a name (ideas anyone?). 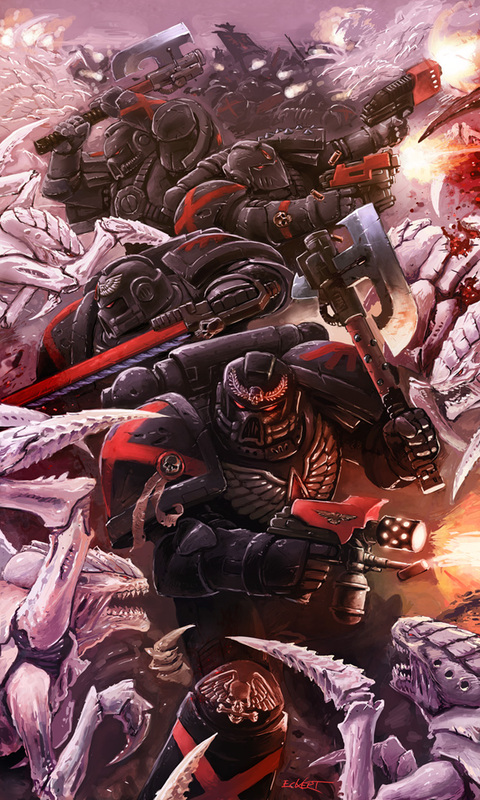 Insofar as names go...do you (or the Blood Angels) have any cultural influences / preferences? As far as I am aware, they are based on Italian/ vampire stuff (I think?). http://www.angelsghosts.com/angel_names (list of angel names). Not bad dude. I'm debating whether I want his name on one of his shoulder pads or not. The God of War series's....interpretation...of Greek mythology is kind of shaky Besides, due to the popularity of those games, everyone would immediately associate you with it, rather than with WarHammer 40,000. If you fancy mythological origins, you could try something like "Hercule Invictus". Hercule is a name derived from Hercules, which is itself a Romanized variant of Heracles - typically given as the paragon of physical strength and ability. Doubly apt for your character, as the original Heracles was driven mad and in a rage murdered his own family. Invictus was a Roman god embodying the 'unconquerable spirit'. Put together, it definitely has a 'death company' / 'black rage' feel to it. As for smashing two mythological names together, the second DoW game featured the Blood Ravens hero Apollo Diomedes (Apollo = Greek Sungod [amongst many other things], Diomedes = Hero of Trojan War)...so it's not totally without canon citation. I actually don't mind Invictus, but I'm going to have a good look at some stage through the angel names link I put up a few posts back. I really like the feel of this pic, although the boys look like they could do with a lot more damage. I actually plan to do a pic similar to this one with Orks instead of Tyranids. I like the Death Co. vs. Orks idea - for some reason, I see the main 'guy' in the picture killing an Ork....with the severed head of another Ork. As for this pic...I must admit, I don't think I've ever seen a single-handed flamer? I do, however, enjoy that he's not even bothering to look at what he's setting on fire. As for the hand flamer, it used to be on a few older Space Marine models. I think that some Sisters of Battle still have them. I don't like them myself. Not brutal enough for me.